This Gluten-Free Lemon Cake is moist, light and fluffy. Full of lemon flavor and topped with a creamy lemon buttercream frosting. The recipe also has a dairy-free option. I love lemon flavored desserts. I love the balance between the sweet and tartness of the lemon flavor. 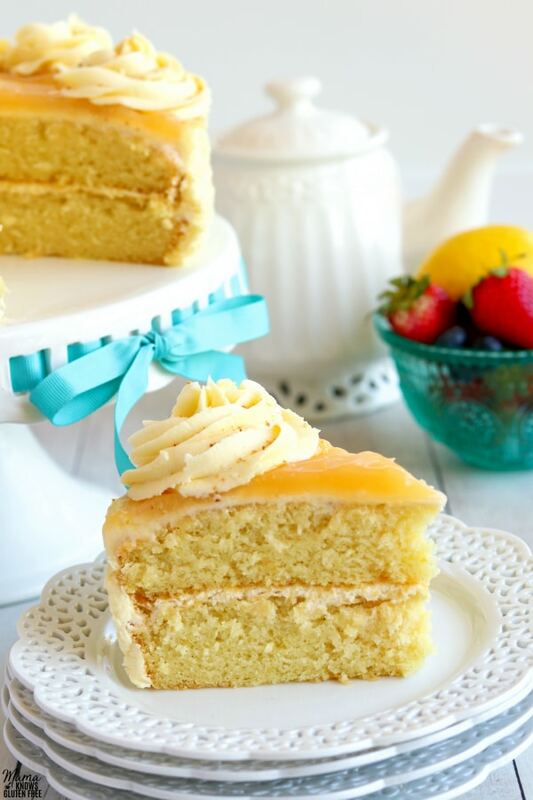 This lemon flavored cake is so bright and is a perfect Spring dessert! This gluten-free lemon cake recipe makes a moist and fluffy lemon cake. It only takes a few simple ingredients to whip up this luscious lemon cake. This lemon cake gets it’s lemony flavor from both the lemon extract and dried lemon peel. Preheat oven to 350°F. Cut parchment paper for the bottom of your two 8″ cake pans and spray with gluten-free cooking spray. Add the milk and mix until smooth. Cool the cakes in the pans for about 10-15 minutes. Place the cakes on a cooling rack to completely cool before frosting. Store leftovers in an air-tight container at room temperature. Can You Use Lemon Juice In Place Of Lemon Extract? Sorry, but the answer is no. Lemon juice has a different level of acidity of lemon extract. Baking really is like chemistry. Lemon extract is lemon oil mixed with water and alcohol that evaporates, leaving the lemon flavor. Make sure you use pure lemon extract or gluten-free lemon extract. Trace the bottoms of the cake pans with a pencil and cut out with scissors to have it fit perfectly! 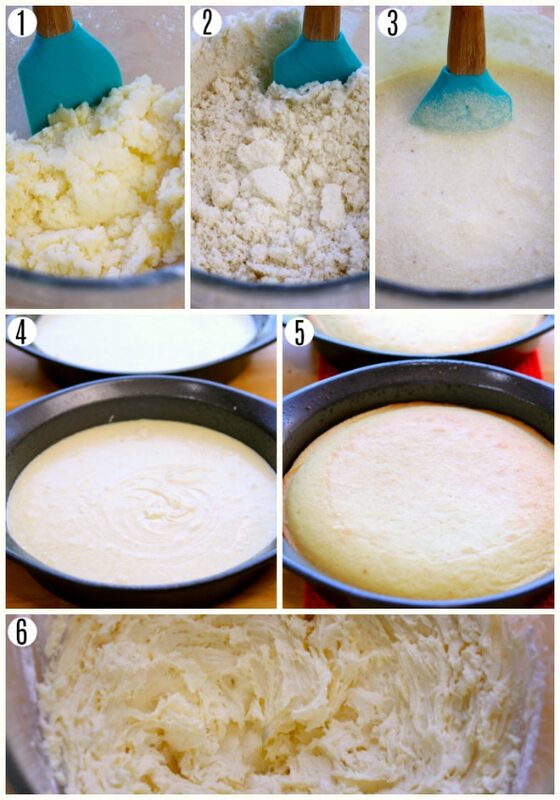 This helps the cake not stick to the bottom of the pan and makes removing the cakes from the pan super easy. Spray cake pans with gluten-free cooking spray. Parchment paper is not enough to keep your cakes from sticking from the pans. Bake the cakes on the middle rack. Check the centers of the cakes with a toothpick to see if it’s done. It will come out clean when the cake is finished baking. Also, the cakes will pull away from the side of the pan when they are finished baking. It’s important not to over bake a gluten-free cake. If you over bake the cakes, they will be drier. If you underbake the cake, the centers will be gummy. Allow the cakes to cool in the pans for 10 minutes, then remove from the pans and allow to completely cool on a baking rack. I baked this gluten-free cake with Pillsbury gluten-free flour. I like baking with a cup for cup gluten-free rice flour blend. A cup for cup all-purpose gluten-free flour blend is one that already has xanthan gum it. Xanthan gum makes gluten-free baking so much easier! It helps replace the elasticity and texture of gluten. Make sure not to add any extra xanthan gum to your flour if it already includes it. If you do, you will get a gummy cake! Most gluten-free all-purpose flours already have xanthan gum already in them. I measure gluten-free flour using the “spoon and level” method. I use a spoon to scoop the flour out of the bag into the measuring cup. After spooning the flour into the measuring cup, I use the back of a knife to level the flour off of the measuring cup. I do all of this over a small bowl so, I don’t waste any flour. Please do not use a measuring cup to scoop the flour directly out of the bag with your measuring cup. In doing so you will not have the correct amount of gluten-free flour and you may have different baking results. I have also included a dairy-free option for this gluten-free lemon cake. Three of us in my family (me included) are also dairy-free, so I always try and include a dairy-free option to my recipes. I used Smart Balance buttery spread and almond milk to make the dairy-free version of this cake. So if you are both gluten-free and dairy-free, you can enjoy the lemon cake. I promise that it is just as delicious made with dairy-free butter and dairy-free milk. Make sure the cake is completely cooled. Place the first cake round with the shiny side down on a plate or a cake platter. Frost the top of the first cake. This will be the frosting in the center of your cake. Place the second cake on top of the frosted first cake with the shiny side down. Frost the top and side of the cake with the remaining frosting. I decorated the top with lemon curd and frosting flowers using a Wilton 1M tip. 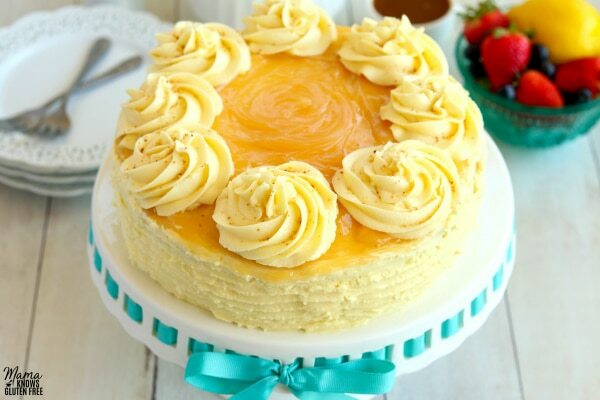 One of my favorite things about lemon cake is that pairs beautifully with so many flavors. Especially blueberries, strawberries, raspberries, blackberries, and shredded coconut. It’s easy to add fresh berries or shredded coconut to the top of the cake, or even into the middle layer of the cake. For adding a filling to the middle of the cake, just add the berries on top of the lemon buttercream on the first layer of the cake. Add the second layer of cake on top of the berries and frost. By doing this you will have a layer of lemon buttercream and berries in the middle. 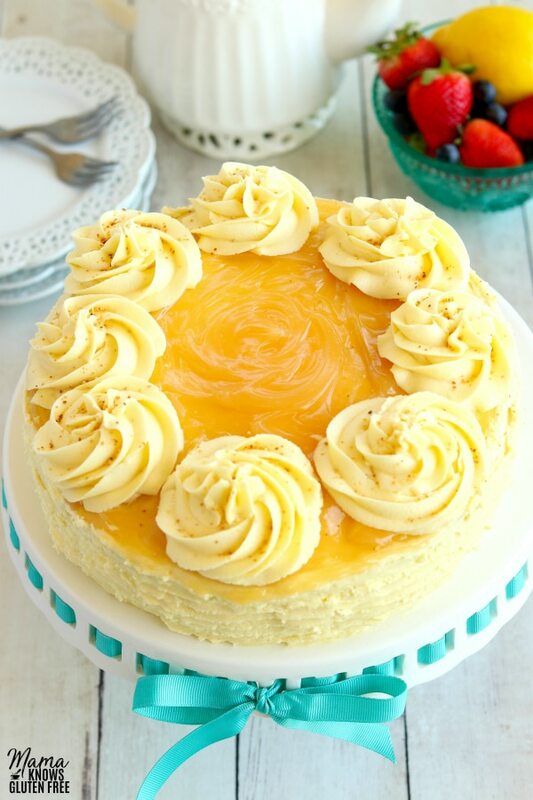 The lemon buttercream has just the right amount of lemon flavor. 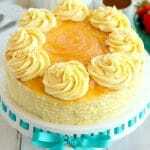 If you want your cake to have an extra tangy lemon flavor, you can top the cake with lemon curd, as I did. This gluten-free lemon cake recipe is one of my favorite year-round desserts, but it’s always a popular dessert for spring and summer. More Gluten-Free Cake Recipes To Try! Preheat oven to 350°F. Cut parchment paper for the bottom of your two 8" cake pans and spray with gluten-free cooking spray. In a large bowl cream together the softened butter and sugar together with a mixer until fluffy. Add the vanilla, lemon extract, lemon peel, food coloring (optional), flour, salt, and baking powder to the butter mixture and mix until combined. Beat in egg whites and mix on high for 2 minutes. Pour half of the batter in the first 8" cake pan and then pour the rest of the batter in the second 8" cake pan. Bake on the middle rack for 25-30 minutes, until a toothpick inserted in the center, comes out clean and the sides of the cake is pulling away from the side of the pan. To make the frosting: in a large bowl beat the softened butter at medium speed, until smooth. Add the vanilla and lemon extract and mix until fully combined. Add the powder sugar one cup at a time to the buttery spread mixture and mix until fully combined. Trace the bottoms of the cake pans with a pencil and cut out with scissors to have it fit perfectly! I measure gluten-free flour is to use the “spoon and level” method. For dairy-free option use Smart Balance buttery spread and almond, cashew or coconut milk. Hi Jane! The recipe includes a lemon buttercream frosting. As stated in my post, if you want your cake to have an extra tangy lemon flavor, you can top the cake with lemon curd, as I did. I bought the gluten-free lemon curd from Publix grocery store. The recipe card with the cake and frosting recipe is at the bottom of the page. Here is the link to the recipe card https://www.mamaknowsglutenfree.com/gluten-free-lemon-cake/#wprm-recipe-container-7176 I hope you enjoy the lemon cake. This cake looks lovely (and I love lemon) and like that you have both gluten-free flour and butter alternates. However, have you attempted this recipe with an egg replacer instead of eggs? Unfortunately in addition to sensitivities to gluten and dairy I am not allowed eggs. This makes finding a cake recipie – or cookie for that matter – that eliminate (or provide alternates) to all of these items extremely difficult. In fact I have yet to find any. Thank you! Hi Willow! Thank you so much. I have not tried this recipe with an egg replacer. I have made my chocolate chip cookies, pancakes and biscuits using Bob’s Red Mill egg replacer. I have not tried any of my cake recipes with an egg replacer yet. Do you have a favorite egg replacer that you use? I was looking for a gluten-free recipe for the whole family and I stumbled on this article. I read and followed the instructions carefully and I made it deliciously! Every member of my family is so happy! Thanks for this! Thank you so much Kate for the wonderful 5-star recipe review! I am so happy that your whole family enjoyed the lemon cake. You are so welcome, I love sharing what I make for my family. Thanks again!